This is another fabulous gem that I spotted online. What a fabulous setting this is! So posed! It appears to be a message from "J.H." to Mr A. A. HUNT who was serving overseas in World War I. J.H. is no doubt a HUNT relation. Is that him carving a piece of cheese or similar with his fine looking pocket knife? The message on the rear of the card was hard to read in part. S. [South] Canterbury boys that are with you. 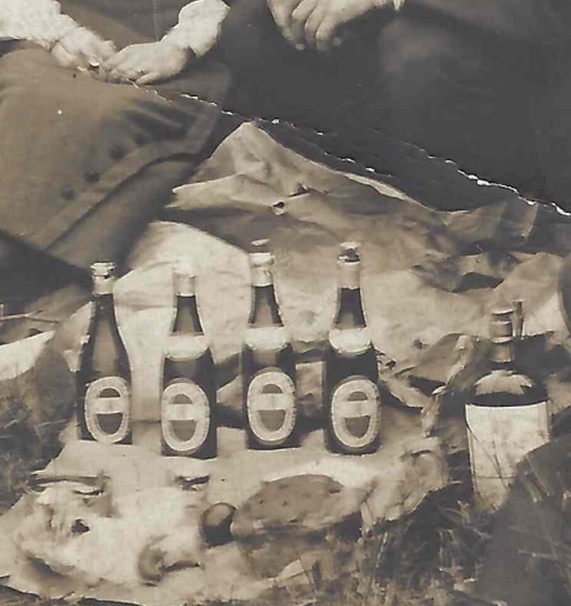 And it appears "Mrs Griffiths" has opened the bottles of beer with the opener that is resting in her hand in the photograph above and below. They are possibly bottles of Speights beer and a bottle further right containing no doubt, a drop of something stronger. The round fruitcake looks very nice and I'm assuming it is the cake mentioned in the message on the back of the postcard. I cannot ascertain what the silver objects infront of the bottles are. A quick look on the Cenotaph Database, I discover Trooper Albert August HUNT 7/68 who enlisted at High Street, Waimate; Military district: Canterbury. Next of Kin given as Robert HUNT, care of A EVANS, South Wellington. His embarkation date was 16 October 1914 from Lyttelton. I have the feeling this is our man. Albert ["Bert"] was injured or became ill and sent home onboard the hospital ship Maheno, due to arrive on the 31 December 1915. He is noted as a member of the Canterbury Mounted Rifles. Also Emily and Harry according to this site. Two of Bert's brothers also served in WWI. » Walter Thomas [or Robert Herman Walter Thomas] who was killed on 5 April 1918 . Interesting to note his military records state the absence of his pectoralis major muscle on the left side - congenital. » James, of whom there are some fabulous photographs of here. Maybe Burt looked like James? James died in 1979 and there is a probate available for him. Bert married 22 year old Elizabeth Laidlaw KELLY 21 June 1917 at the First Church, Dunedin & . She was the eldest daughter of Mr and Mrs Andrew KELLY, of Anderson Bay, Dunedin. 1949 they were both now living at 162 Mt Albert Road, Auckland. Bert was a mechanic. He died 2 November 1970 and was cremated at Rotorua Cemetery, Sala Street, Rotorua. Ashes in Niche Wall 1 Row C Plot 4. Elizabeth died 23 March 1969 aged 74, was cremated and her ashes are with Bert or scattered [cemetery database states both]. 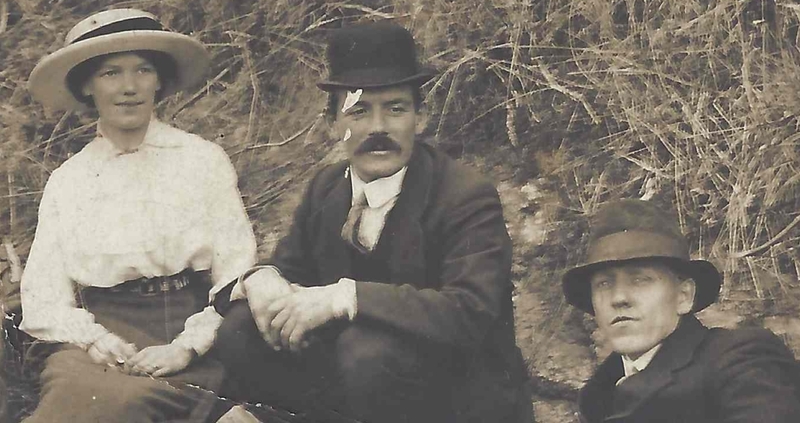 A search of Archives NZ information portal Archway shows that Albert August HUNT, mechanic, has a probate available. Also a probate available for Elizabeth. Wasn't it good that "J.H." wrote those initials and surname on that card! Today I received a delightful email from Lynn Berry, UK. Thank you Lynn! Albert August Hunt, to whom the post card is apparently addressed, is my great-uncle. His sister Minnie Eveline Louisa Hunt was my grandmother (who I never met). 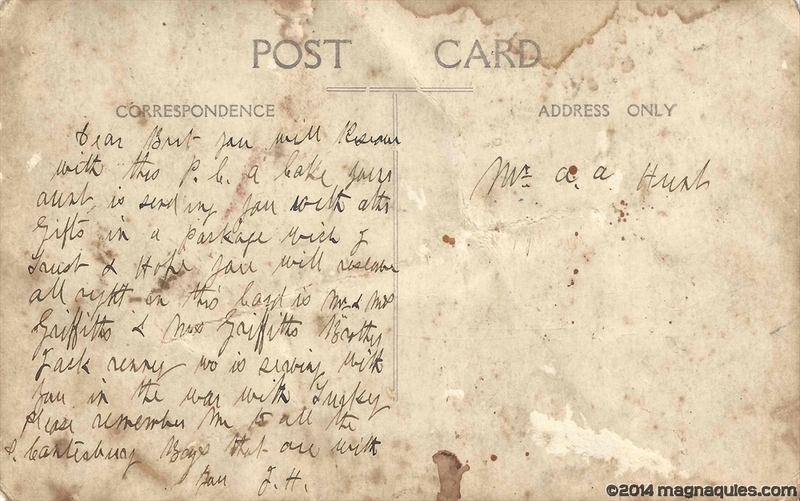 It is possible that the signature on the postcard, 'J.H. 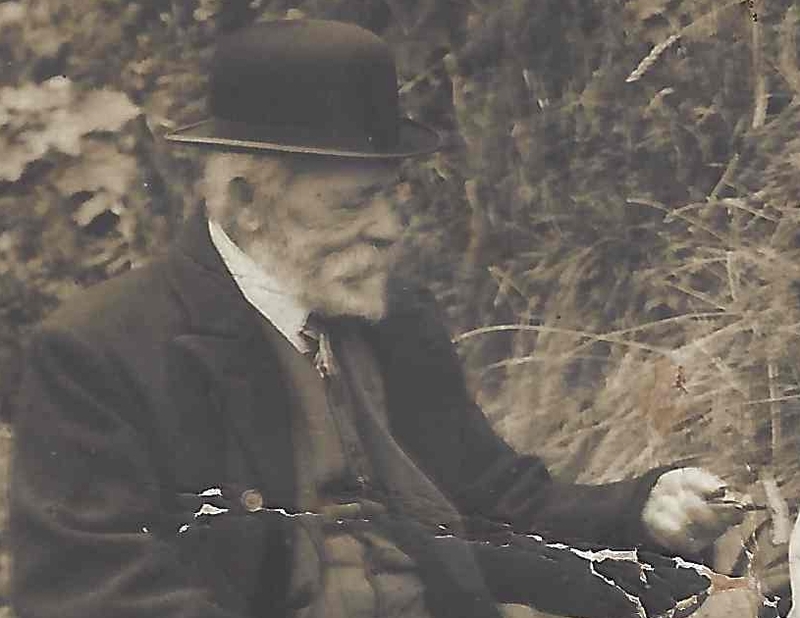 ', represents Patrick Joseph Healey, (1854-1936) Albert's uncle and that the 'aunt' that he refers to as sending a cake, is Albert's only aunt, Patrick Healey's wife, Johanna Wilhelmina nee Thim (1861-1919). 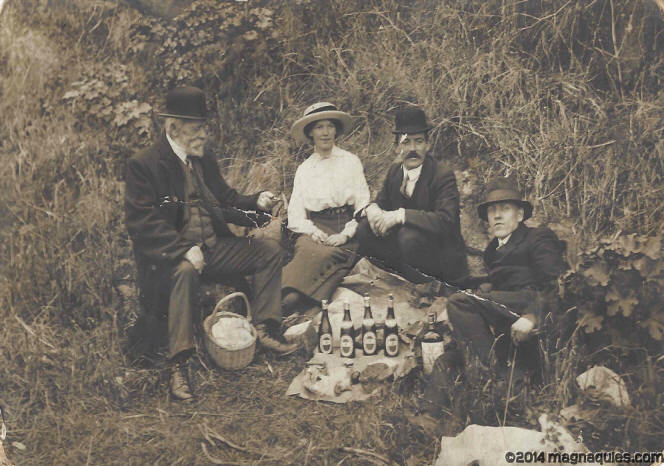 On that basis, perhaps the older gentleman in the photograph is Patrick Joseph Healey himself, who would have been 60-61 in 1914-5, the likely time of this postcard to Albert. I also wonder if the illegible word in the first and fifth lines is 'reseave', or 'receive' spelled incorrectly. The third line, I believe, is 'aunt is sending you with other' as J.H. writes 'you' in the same way in other lines. Anyway, thank you so much for taking the time and care to share this post card and your research about Albert and his family. It is appreciated.